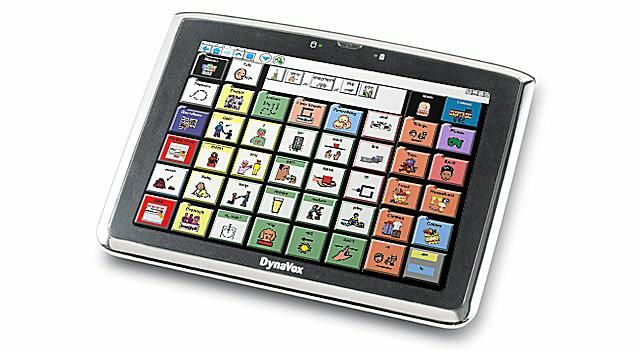 The DynaVox Maestro helps users with speech, language, and learning disabilities to communicate using text, symbols, and synthetic speech. DynaVox, Inc. The DynaVox Maestro is a portable speech-generating device that resembles a tablet PC. The Maestro is a popular augmentative and alternative communication device designed to enable people who cannot speak to access the words needed to create messages and converse. Users of this type of assistive technology have severe speech, language, and learning disabilities resulting from conditions such as autism, cerebral palsy, or Down syndrome. The Maestro uses touch-screen technology, text to speech, and special software to provide users with many options for message creation and delivery. What powers Maestro is a communication framework called InterAACT and DynaVox software called Boardmaker, a platform for creating content using symbols rather than words. Boardmaker's proprietary symbol sets are extremely popular among special education teachers. Many teachers use Boardmaker to create materials and activities for non-verbal children. The Maestro displays or reads aloud text or words associated with images that users tap on the touchscreen. Pages and page sets can be customized so users can quickly communicate any thought, mood, or desire while building their vocabulary. The Maestro is available in two versions: dedicated and standard. The dedicated version is designed just for speech output and only supports DynaVox communications software. The dedicated model meets Medicare requirements for a speech-generating device. The standard version can be used as a PC and supports additional Windows 7 programs. Boardmaker and Speaking Dynamically Pro are preloaded on every standard Maestro. Ability to compose longer messages using content from stored text files and the web. Onscreen Keyboards & Mouse Controls: The Maestro's onscreen keyboards - similar to Windows On-Screen Keyboard — enable users to enter words, phrases, symbols, and commands into active Windows applications. Series 5 Software supports many applications, including Google Mail, Calendar, Open Office, and Mouseless browsing via Mozilla Firefox. Text to Speech: The Maestro provides a wide range of clear, synthetic voices - including AT&T Natural Voices and Acapela HQ Child and Adult Voices - so messages are easy to understand immediately. Speech options support both new and pre-programmed content. e-Book Reader: The Maestro's built-in eBook Reader enables users to listen to text and DAISY formatted e-books downloaded from the Internet. Users can also customize settings and controls for book size, placement, and navigation. How Many Mobile Devices You Have Now?